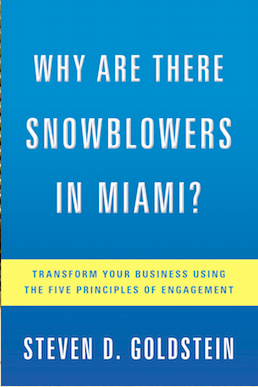 Book Review: Why Are There Snowblowers in Miami? Why Are There Snowblowers in Miami? (Transform Your Business Using Five Principles of Engagement), written by Steven D. Goldstein, published by Greenleaf Book Group Press, September 2016. Once in a while, I read a book and I just can’t relate. The author’s experience was not my experience and the storytelling leaves me on the outside looking in. Other times, there are writers that immediately draw me in. Even if I have not experienced what they are describing, I can feel it through their words. Then, there is Why Are There Snowblowers in Miami?. I read it this week and wondered when the author visited my former work life! I am already looking forward to re-reading it because there are so many great stories and useful tidbits to take away from it. I only wish it had been written five years ago when I was working full time in corporate America. The five principles of engagement are offered right up front: fresh eyes, connecting, hot buttons, transparency and speed. What do they mean? Well, you’ll have to read the book to learn more but, rest assured, the rest of the book offers valuable insights, real life examples, plausible solutions, and abundant encouragement. Can a book about employee engagement really be an interesting read? This one certainly is. Here are just a few topics that held my attention; I bet you can relate to some, if not all, of them. I’ve often thought about employee engagement but had not given a lot of thought to leader engagement. Disengaged leaders (isn’t that an oxymoron?) can break a team, veer an organization off course and kill innovation. As I read about this topic, recalling leaders I’ve worked with over the years, light bulbs were going off left and right! “Meeting hell” is a problem at many organizations; decision meetings that end up without a decision, meetings in which too many – or not the right – people are included, meetings held just because they are on the calendar, meetings to plan other meetings. Then there are the handouts; they are either not sent a couple days in advance so invitees have the chance to read them, or they are sent in advance but not read by the meeting invitees. The author provides guidelines on effective meetings; which ones to have and how to make them productive. Email, email, email…another challenge. Too many people cc’d on them to begin with, then everyone weighing in with an opinion and choosing “Reply All” instead of just responding to the sender. One email quickly multiplies and before you know it you have ten new messages. Is that really communication? The importance of talking to and connecting with frontline leaders and customer-facing staff is near and dear to my heart. Who directly interacts with your product, service and/or customer? Those are the people with the most valuable insights and, often, the best ideas to make customer service better. Yet, the decision-makers rarely spend any time with them. Goldstein spends a good amount of time explaining why this activity is so critical. Information sharing, or the lack thereof, is another challenge in many companies. Employees want to know how decisions are made, what the corporate financial status is, how market trends or product and customer news might affect the business. Providing this type of information in a consistent, accessible and comprehensible manner increases employee loyalty and engagement, yet so many leaders hold it close to the vest. What can big business learn from start-ups? A lot, according to Goldstein. There is a reason why start-ups have a high level of employee engagement! Established companies can learn from their example by adopting a “there is no ‘no’ attitude”, learning to pivot, and acting quickly; three topics discussed in this section. And, by the way, why are there snowblowers in Miami? Well, you’ll have to pick up the book and find out. Click here to order a copy from Amazon. It will be a great addition to your business leadership library. A copy of this book was provided to me at no cost by the publicist. In no other way was this review influenced by the publisher, author, or anyone else connected to Why Are There Snowblowers In Miami? The opinion expressed here are entirely my own.